If you installed the Metasploit Framework with the 4.4 installer or earlier, you’ll need to take action. You won’t get updates from msfupdate without action. You can uninstall the Metasploit Framework and setup an environment with the 4.5 installer. Beware, it’s different from the previous installers. The 4.5 installer requires you to register for a Metasploit Community Edition key to use msfupdate. The 4.5 installer also uses the same Metasploit code base / db tables for the open source and commercial interfaces. This has already led to some fun. The benefit of the 4.5 installer is that it pulls tested changes only. The Rapid7 QA team works through a snapshot of the framework once a week and clears it for release. In the 4.5 environment, this tested snapshot is what msfupdate will pull if you register for a key. 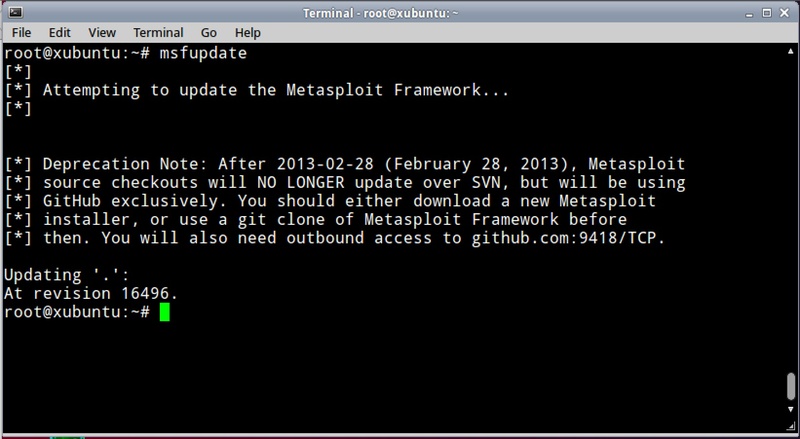 At this point, your Metasploit Framework source code is now pulled from Github. If you use msfupdate, the script will detect the Git tree and pull updated source code from the master branch. Pretty easy.